This article is very kindly contributed by our friends and colleagues in France. In France, the most common type of subsidiary company within a multinational group is a simplified joint stock company (“SAS”). Dissolution without liquidation also called Universal Transmission of Assets (or “TUP”). In both cases the assumption is that the French subsidiary is wholly-owned by the foreign parent company. If this is not the case then regrouping the shareholding will be dealt as a preliminary step. 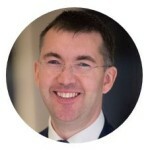 In cases where this is not possible a dissolution followed by a liquidation may be envisaged, although this is not common practice in an intra-group operation. 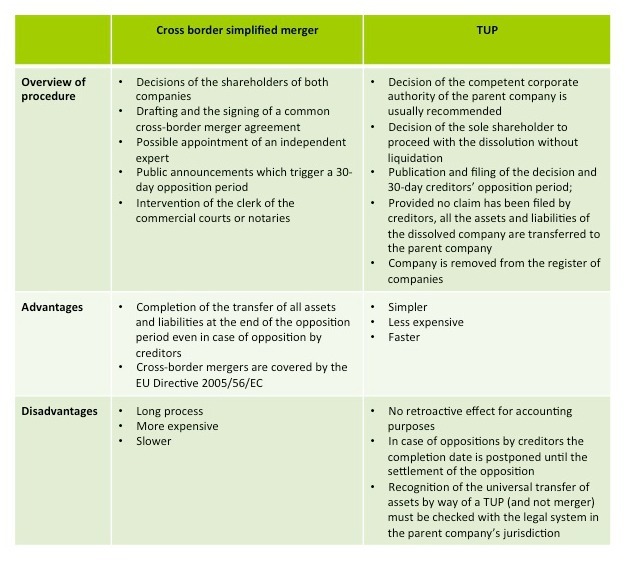 The key legal differences between a cross-border simplified merger and a TUP are summarized in the following table. The main consequence of the cross-border merger, as in the case of the TUP, is to entail the automatic transmission of all the assets and liabilities of the wholly owned absorbed company to the benefit of the absorbing company, without the liquidation of the absorbed company. From a legal standpoint, the TUP is similar to a merger into the sole shareholder where the sole shareholder directly acquires all the assets of the company but also the responsibility of paying the entirety of the liabilities of this company (tax and any other debts). It is nevertheless recommended to check whether or not there exist specific constraints relating, for example, to the assignment of certain contracts entered into on an intuitu personae basis (i.e. 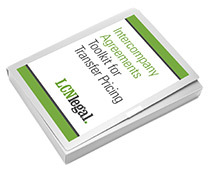 the transfer of these contracts may be subject to the prior consent of the counterparty). In short: using a cross-border simplified merger is more expensive and slower, than the TUP. They both have the advantage that assets and liabilities are automatically transferred by operation of law. However, under certain circumstances, a cross border simplified merger is the only possible legal route.